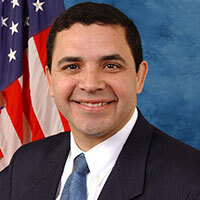 Dr. Henry Cuellar has served as Laredo’s State Representative, Texas Secretary of State, and now as U.S. Congressman for the 28th District of Texas and sits on the powerful House Appropriations Committee and Subcommittees on Homeland Security and Defense. Prior to this role, as a Texas legislator, Dr. Cuellar created the TEXAS Grant program—the largest in Texas history—allowing students to attend college; created the state’s first children’s health insurance pilot program that became the statewide Children’s Health Insurance Program (CHIP) model; co-sponsored the largest tax cut in Texas history; and helped transform the Texas budget into a results-oriented one. Dr. Cuellar is married to Imelda Cuellar and they have two children, Christina and Catherine Cuellar.